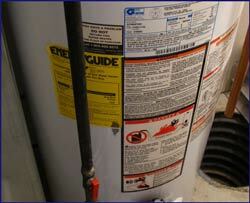 The method for how to turn on a water heater involves a few steps. It sounds like a simple thing, but there is procedure that should be followed. 'troubleshooting electric water heaters' for information on identifying your exact problem. You will have to follow different steps for gas and electric water heaters. Propane water heaters will be the same as natual gas. (1) Close any open faucets or vavles. (2) Turn on the cold water supply. (3) If the gas was completely off, re-lite the pilot light. If you were working on your hot water tank, you should have opened a faucet to allow air to get into the tank. This prevents the creation of an airlock. Now that you are ready to turn the water back on, you can close the faucets. Before you turn the gas back on and light the pilot, you want to turn on the cold water and let the tank refill. The heating elements should not be turned back on with a partially filled tank. At this point the tank will fill with water, replacing any that was lost while working on the tank. Every water heater has a slightly different procedure for lighting the pilot light. See the article on 'how to light a gas water heater pilot light' for complete instructions. If you were able to just turn your gas valve to 'Pilot', you will not need to light the pilot light. Instead, you should be able to turn the gas valve to 'ON'. The water heater should start heating the water at this point. So the burner should fire up. If for some reason it does not, you will need to follow the complete pilot lighting instructions. See the article on 'lighting pilot lights' for information. 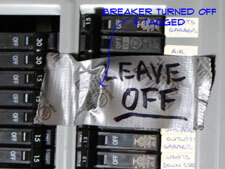 (3) Remove the lock out tag from the breaker box. (4) Turn on the circuit breaker for the hot water heater. Before you turn the power back on, you want to turn on the cold water and let the tank refill. The heating elements should not be turned back on with a partially filled tank, it can damage them. This is the piece of tape that you should have put over the breaker warning anyone that gets into the panel not to turn that breaker on. This a safety procedure that can prevent shocks and even death. There is no indicator light on most electric water heaters to tell you that the unit is on. You should hear some sounds that indicate the the heating elements have engaged and the water is starting to heat. The water heater should start heating the water at this point. Witin 30 - 60 minutes you should have hot water. Carefully check one of the faucets to make sure the water is getting hot.